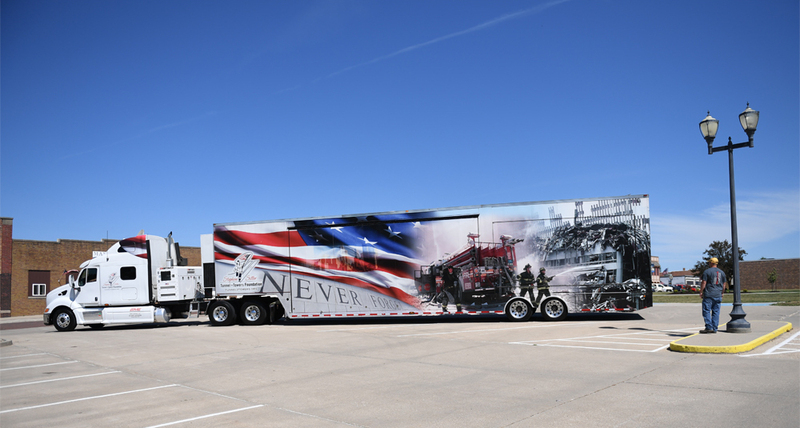 The Tunnels to Towers Foundation brought its 9/11 Never Forget Mobile Exhibit to Rockport this past weekend, February 16-18. More than 1675 people waited 30 or more minutes to take the 20 minute tour guided by New York firefighters. Volunteers distributed water and talked with those who were waiting. Many more viewed the outside exhibit materials, including the Flag of Heroes. The tractor-trailer is 53 feet long and transforms into a 1,000 square foot exhibit. Also on exhibit were several fire trucks and a flag with the names of those who perished on September 11th. To date, more than 250,000 people have viewed the exhibit. The Rockport visit was sponsored by the Rockport-Fulton Chamber of Commerce, the City of Rockport, Aransas County Navigation District, and local clubs, businesses, and organization. Weekend activities included ceremonies with firefighters and first responders from nearby communities, reading of the names, and a "candlelight" prayer. The exhibit has been touring since 2013 and is a "tribute to all those who lost their lives on September 11, 2001, including, of course, the 343 members of the FDNY who made the ultimate sacrifice." According to the Foundation, they "honor the sacrifice of firefighter Stephen Siller who laid down his life to save others on September 11, 2001" and "also honor our military and first responders who continue to make the supreme sacrifice of life and limb for our country." The organization sponsors the annual Tunnel to Towers 5K Race in New York City and builds smart homes for members of the US Armed Services who have been catastrophically injured so that they can regain their independence.